International Journal of Pure and Applied Zoology is currently indexed in Emerging Sources Citation Index, a New Edition of the Web of Science launched in November 2015. Therefore, all the articles published in the journal will be available in Web of Science database. 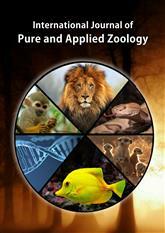 The International Journal of Pure and Applied Zoology (IJPAZ) is a peer-reviewed, open-access journal. It aims at promoting research worldwide and publishing high quality original basic and advanced research work from all branches of Zoology. It follows quarterly issue release. In the present century, there is a tremendous growth in each field of Zoology. But, researchers still have to wait for a long time to publish their research articles in reputed journals. To tide over this disadvantage, we have launched this online and printed version research journal to meet the needs of the global scientific community and to disseminate the significant new findings to the readers. Subject Areas: IJPAZ publishes original innovative scientific research papers, short communications and review articles in all areas of zoology such as physiology, cell and molecular biology, genetics, biochemistry, biotechnology, bioinformatics, microbiology, immunology, Parasitology, endocrinology, neurobiology, enzymology, toxicology, environmental biology, developmental biology, marine and aquatic biology, stem cell research, vermin-technology, aquaculture and entomology. The International Journal of Pure and Applied Zoology provide a forum to the researchers for scholarly exchange of ideas, knowledge and experiences in this field. We request you to kindly submit your research paper, short communication, a review, case study etc., through our online system at www.editorialmanager.com/alliedacademies or email us at [email protected]/ [email protected] for our upcoming issue (Volume 7, Issue 1, 2019).